"Of course, the capitalist economy will not simply come to an end. Resisting such an outcome, the great powers will no doubt continue to fight over natural resources and markets. Yet I believe that the Japanese should never again choose such a path." In brief, though, a problem that comes up again and again, as this points up a continual elision in thought, including my own at times or often, and visible in Karatani's piece at the telling point of where the article ends (that courage of striding down a new path and the phrase "It may be that only amid the ruins"). [Namely, that given we know historically about collapse and breakdown, that unless one wants to commit to some notion of "the human spirit" ill-advised, given its track record), disaster - on jerky fast-forward or frame-by-frame, exchange-by-exchange - gives no preference to communism as its recuperation. To say that "The reality, however, is that people who regarded one another with fear when living in the social order created by the state form communities of mutual aid amid the chaos following disaster, a spontaneous type of order that differs from that which exists under the state" may be true in certain instances, when disasters look like disasters, when they are clear and punctual and cannot be mistaken. But such disasters are barely half the story. For when we include in disaster - as we must - things like war, massive inflation, stock market crashes, violent purges, mass unemployment, epidemics, who can remotely say that the general tendency is to stop regarding each other with fear? Who can say that outside of the most immediate circuits of those wrecked and plagued, that disaster bears any necessary relation to a new form of community? No, it is a worsening, plain and simple and awful. Between these three cases, something like a present. The point, the vicious fact of it, is that it simply is not our decision. We choose a period of capital as much as we choose an earthquake. To make of this a principle, not of withdrawal but of holding on and forth: such would be a courage, to hate the ruined and the unruined alike, with neither fetish nor indifference, to know that we cannot make our time, but that it does not, and never will, unfold untouched. this space that sometimes opens between the nightmare of history and the worsening we pretend to push away into "just beyond" is the only time we ever have. Agreed and well-put. And perhaps "the only time we ever have" in two senses. First, in the more obvious sense of that small window of time - the only span in which time isn't just labor time - in which to push at the limits of a struggle, to open up the contradictions already there. If there is a sense of voluntarism or decisionism that makes sense, it would be that which finds itself in those tiny windows, where concerted attack seems to have a more direct effect, even if such effects can never be entirely predicted. The other sense, though, is that: we know no other time than that space, and if we want to speak of the nightmare of history, it would be to say that such a window (between, let's say, an ongoing sequence of capital's developement and an apparently punctual moment of that worsening) is, in fact, a yawning one. We perhaps don't know time - that is, "historical time" - that isn't that. Such that the worsening is epochal, immense, and the more concentrated moments (of the "new bad times") primarily point up what is already the case: that the "just beyond" has been a long time coming, at least according to the guesses of some very smart people, and it has come no closer, at least not without sliding back into what no one could call "beyond" all this. 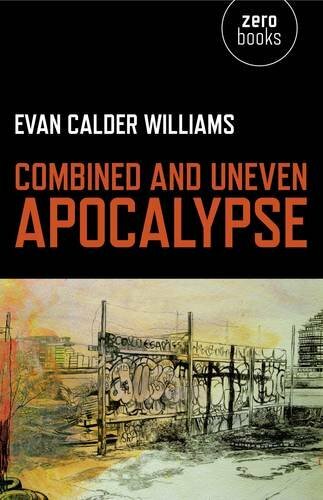 This reads a little bit like Jameson's recent work (I’m thinking of the newer material from Valences), with much added pessimism and difficulty. I hope you take that as a compliment. I most certainly do - many thanks.